Carl grew up in Connecticut in a musical family, where he started drum lessons in the fourth grade and was inspired by classic and progressive rock artists throughout junior high and high school. He began to take his growing passion more seriously, participating in marching and symphonic bands and wind and jazz ensembles. Carl made the All-State Orchestra in high school, and performed at an All-New England Orchestra while attending CCSU (Central Connecticut State University) and while studying classical percussion (snare drum, marimba, timpani) under the tutelage of Connie Coughlin, principal percussionist at the Navy Coast Guard. After two years at CCSU, he transferred to Berklee College of Music where he obtained his BA in Music Performance. 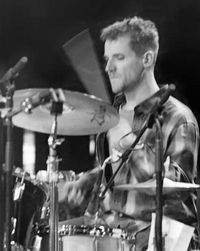 While attending Berklee, Carl explored contemporary drum set styles within various ensembles and classes, focusing on jazz, Latin, funk, fusion, and world music, under the apprenticeship of artists such as Kenwood Dennard, Ian Froman, Jon Hazilla, Nancy Zeltsman, and Casey Scheuerell. Carl currently teaches at Needham Public Schools as well as at WCMS, and performs in and around Boston and New England in various musical groups ranging from small combo jazz to big band, folk, funk, indie rock, and theater. Some recent projects include Echo and Drake, who were recently featured in Paste and American Songwriter magazines; Zen Carnival; and Vanessa Kafka. Carl's passion as a teacher is to create a positive blend of education with an exciting musical environment, incorporating the latest contemporary music (student and teacher influenced) while also introducing a broad range of traditional styles, techniques, and exercises for developing a well-rounded musical experience and musician. He works with each student to develop their individual goals and achieve their highest potential.